I took Jobs’ quote to heart apparently, picking nearly 80 pounds of berries so far this season. With jam and biscuits behind me and no room in the freezer for sorbet, I turned my sights elsewhere. First, marionberry pastilles, which satisfied my hunger to transform at least part of my stash before they turned to mush. And foolish to have tripled the recipe. 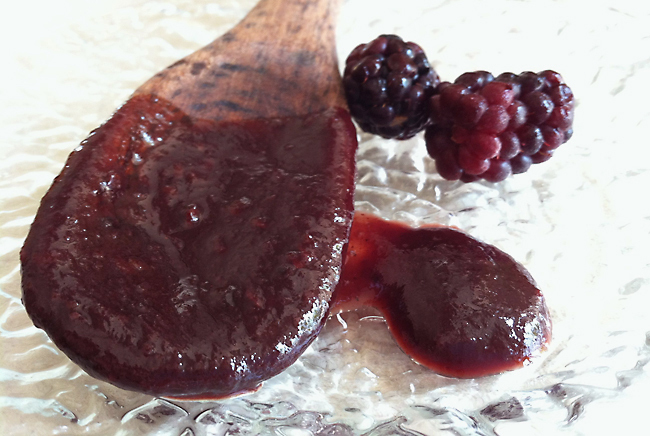 The next was marionberry barbecue sauce with some of the leftover pastille goop. Perfect for the pulled pork I had just made. But first, a bit about marionberries. If anyone thinks kite boarding and mountain climbing are Oregon’s extreme sports, they haven’t picked marionberries. Every inch of the plant, except the berry itself, is coated in thorns. This includes the back of the leaves you often must brush out of the way to find berries overlooked by the previous picker. But, as in many cases in life, greed and desire outweigh practicality. Both recipes, slightly modified, came from The Berry Bible by Portland author Janie Hibler. Pastilles are essentially gumdrops, often served in Europe at the end of a meal. They’re made from fruit and sugar cooked down to a thick consistency so that the flavor is very concentrated. Like making jam, only cooked longer. I confess I had a problem with my pastilles. The recipe called for raspberries but I used marionberries and the mixture took hours to thicken properly. I also used less sugar than the recipe called for. It might have been that marionberries have more liquid. Another recipe (raspberry passionfruit pastilles) calls for pectin, which you might try if you don’t want to be up all night. Pastilles require some work to cut and free from the pan. But they are sure to delight the friend who receives them in a pretty box. My neighbor and taste tester suggested serving these at the end of a meal with cheese. Tested with goat cheese, they passed! 2 pints (4 cups) fresh berries, rinsed and drained, puréed and seeded, to make 2 cups purée. Preheat the oven to 300 degrees F. Butter and 8-inch pan. Put 1/4 cup of the sugar in a small bowl and set aside. Combine berries and sugar in a wide saucepan over medium heat. Bring to a boil and cook for 2 minutes. Reduce heat to low and simmer gently for 20 minutes, until the mixture leaves the side of the pan and a spoon drawn through leaves a trough. Pour into the pan and bake for 10 minutes—the fruit will bubbling rapidly. Let cool in pan. When the candy is completely cool, cut into squares. To remove the pieces from the pan, rub a little oil on the tip of a knife blade or small spatula and dip it in the remaining sugar. Pick up one piece of candy at a time and completely coat it in sugar. Store in plastic wrap in a well-sealed container. Should keep for years if covered tightly. 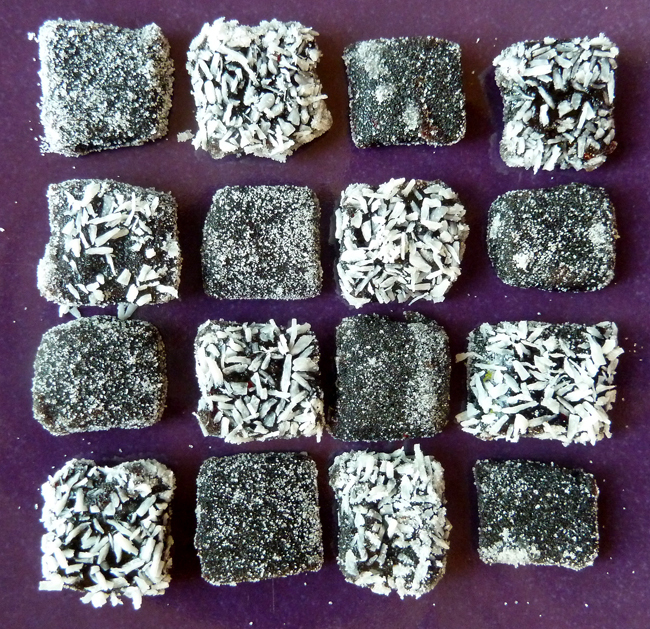 Variations: rolled sugared pastilles in grated coconut or dip in melted high-quality chocolate. Have you ever made pastilles? If so, let me know how yours turned out. I tired of cutting pastilles (remember, I tripled the recipe), so I saved the leftover mixture. That I had just made my first pulled pork called for barbecue sauce so I modified an American Barbecue Sauce recipe from the same book. Instead of 2 cups of berries, I used some of the super-intense pastille mixture, which already contained sugar so I left out the 1/2 cup of corn syrup the recipe called for. I might have left it out anyway, even using straight berries because I wanted a tangier sauce. I also adjusted some other ingredients and left one out. You might opt for the lesser amount of each ingredient, cook the sauce till it’s thick and then adjust to taste. How sweet, tangy, spicy or garlicy the sauce is should depend on your preference. Puree all the ingredients in a blender. Put in a small saucepan and simmer for 1 hour until the sauce has thickened. Allow it to cool and store in a jar in the fridge for up to 1 month. The sauce can be used on chicken, pork, ribs or duck. Next up? Maybe a tie died tee shirt with marionberry juice. Oh pretty! and the recipes sound delish. Marionberries must be like the wild “raspberries” around here. A friend lets them grow in her yard because they taste so good. During the season she looks like she’s been fighting with multitudes of cats. As to tie-died tshirts, mine would probably already be that way after dealing with all that fruit juice. The pastilles turned out tasting a bit like prunes but a bit more tart. I think raspberry would look prettier. Here’s a great chart about the marionberry cultivar. http://en.wikipedia.org/wiki/Marionberry It’s really in the blackberry family. I especially love the disclaimer at the beginning of the wikipedia link. For information on the former DC mayor, go elsewhere.